I try to keep the content of this blog light and focused on sharing the things that make me happy — great design, good food and of course, travel. But every once and a while, I am tempted to take a moment to rant just a little. So please indulge me for just a minute . . . There are two things about our current state of society that drive me crazy. Two really simple things that, honestly, I feel should be basic knowledge taught in our schools. Yet everyday I am reminded that in today’s world, kids don’t learn the basics anymore. 1) How to count change: This is not a difficult task. Yet in today’s world, if a computer doesn’t tell a cashier how much to give back to the customer sheer panic sets in. And God forbid you give a cashier an extra coin or single so you get larger bills back — off the charts confusion and panic. Counting change is really simple. You don’t even need to know how to subtract. You just need to know how to count. Starting with the amount of the sale, simply count up change until you reach the amount you were handed in cash — coins first until you reach 100 or the next full dollar amount, then the bills. By the nature of that process, you will give back the most efficient combination of coins and bills. 2) Where/What is Washington, DC: Twice in the past week, when I handed my driver’s license to people, they both tried to verify my number in the state of Washington. Are you kidding me? Washington, DC is the capital of our country. It is not located in the state of Washington. In fact, it is clear across the country. It is a federally created district that houses the seat of our government. That city where the White House is. Surely you’ve heard of it? When filling it on forms, addressing a letter or looking up driver’s license numbers for that matter, Washington is the city and DC or District of Columbia acts like the state — short and long form, respectively. And every American should know this. Our nation’s capital is not located in any state. It is a small district provided for in the U.S. Constitution under the jurisdiction of Congress. It is NOT located in the Pacific Northwest, it is located on the East Coast between Maryland & Virginia. There, I said it. Thank you for listening. It’s the end of the year and simultaneously the end of my 3 1/2 year stint in our nation’s capital. On January 1st I will wake up to a new life in Southern California. Warm weather here I come! Happy New Year everyone. More soon from California . . . When Bon Appetit names a restaurant in your own back yard, the best new restaurant in America one has to brave the line — a line that starts dutifully at 4 PM everyday for a 5:30 PM first seating — and try it. Let me first say that I, who got stuck on a non-moving metro train, did not have the pleasure of waiting in line for an hour and a half. But I understand I missed the camaraderie of the line dwellers. So maybe it is all part of the experience. Next, eating a big dinner at 5:30 PM was a bit disorienting. It felt like midnight when we left yet was only a bit after 8 PM. And I was mighty drunk at that early hour. The cocktails are strong and shall I say, FANTASTIC! So in short, yes. Rose’s Luxury is damn good and worth it. Here’s their schtick and why the place is so beloved — FREE FOOD! You order 2-3 small plates per person and add in a large plate (there’s only two on the menu each slightly larger than a typical single entree) and they throw in a few tasting size plates along the way of the stuff you didn’t order. In our case, because we were there drowning our sorrows as a group, not only did we get a free tasting small plate and dessert, our waitress took pity on us and presented a free large plate of brisket to our already gluttonous mix. Sfoglini rigatoni with parmesan cream, breadcrumbs and a blizzard of white truffles — our second favorite. Oh but that’s not all. We ordered our own full size dessert that while it looks a fright and hardly dessert like, is totally worth going back for. Green Pea sponge cake donned with buttermilk, pea shoots & glazed pistachio nuts. And if that’s not enough, the bread that starts the meal served with butter and honey is to die for. But so are the sesame brittle bites that come with your bill. And don’t think those freebies aren’t noted on that bill where exclamation points take the place of prices. This is a marketing ploy after all, they want you to know the good will that has been bestowed on you. And you know what, it works. No reservations, just get on line. Approximately $100 per person including excess alcohol. So I went to the unveiling event for the 2014 Rudolph Holiday Stamp Collection and what I discovered was the amazing Smithsonian National Postal Museum. Why is it that we never take advantage or know about these wonderful places right under our noses? I honestly never would have thunk to visit the Postal Museum had I not been invited to this event by a talented design firm I employ often whose principal sits on the Citizen’s Stamp Advisory Committee. And as luck should have it, not only were we the first ones able to purchase the new Rudolph stamps (aren’t they adorable?) but we also got an unexpected private tour of the museum’s William H. Gross wing by the museum director himself. Did you know that Franklin Roosevelt, an avid stamp collector, used to design his own stamps, supplying hand drawn sketches to the postmaster general to create? Did you know that John Lennon was a stamp collector as a kid? The museum owns his collection complete with little mustaches drawn on the queen’s image and all. Did you know that Amelia Earhart funded her flights by carrying mail on board and signing the letters? You could spend hours and hours in this museum — for real! Featured items on display include the very first stamp in the world. a letter dating back to the silk road, a letter posted to John Hancock on July 4, 1776, a letter posted on the moon and so much more. But the real gems are in hundreds of pull out displays showcasing more stamps, artwork and history than you could ever possibly get through. A reason to go back again and again. One little tidbit that I loved learning from the director was about the beautiful window graphics that line the 18 windows across the front of the building — printed scrims of super large scale stamps that tell the history of America. Being a historic building nothing can be touched or changed without permission of government committees, in this case 3 different committees. Instead of simply asking permission which would assuredly garner 3 no’s, the director put a slew of stamps on the table and asked, “If you were going to pick the stamps to tell the American story, which stamps would you pick?” — and suddenly these government officials were engaged and boom, 3 yeses! Drive by at night and see the scrims lit up across the face of the building and you’ll marvel at their beauty. Stamps are nothing if not beautiful. So celebrate their beauty and history with a visit to the Postal Museum on your next visit to Washington, DC. I’m a fan of the juice cleanse (especially after the recent hot dog splurge) to get my body back on track. And now I have found a new, local juicery that not only has delicious juice in glass bottles no less, but they deliver right to your door anywhere within the Beltway between 5-8:30 AM for $10. And they have a bit more choice in green juice combos than my old mail order juicery. In fact, there are choices for all the juices and there’s not a dud in the bunch. While Jrink has two standard cleanse packs to choose from, I prefer to put my own daily combo together to mimic the routine I’m used to — 3 green juices (I mix ’em up), 1 lemon cayenne, one pineapple mint (my absolute favorite!) and a hazelnut or almond milk to round out the day for a calorie boost and creamy treat. If you are in the DC area, they have a shop in Dupont with another on the way in Logan Circle. Or order online. Thirty-six hour notice required for delivery. 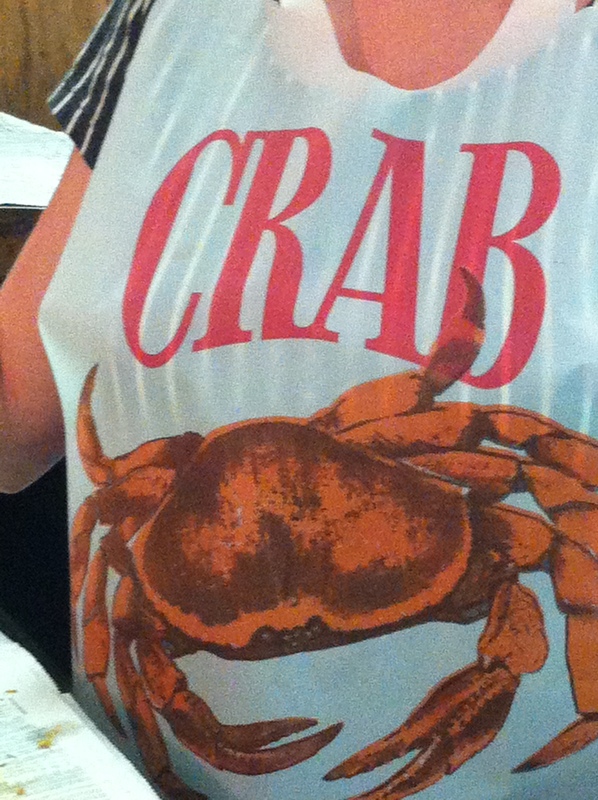 My first crab picking experience. Not at the shore but at a little joint in Bethesda that is just as fun. 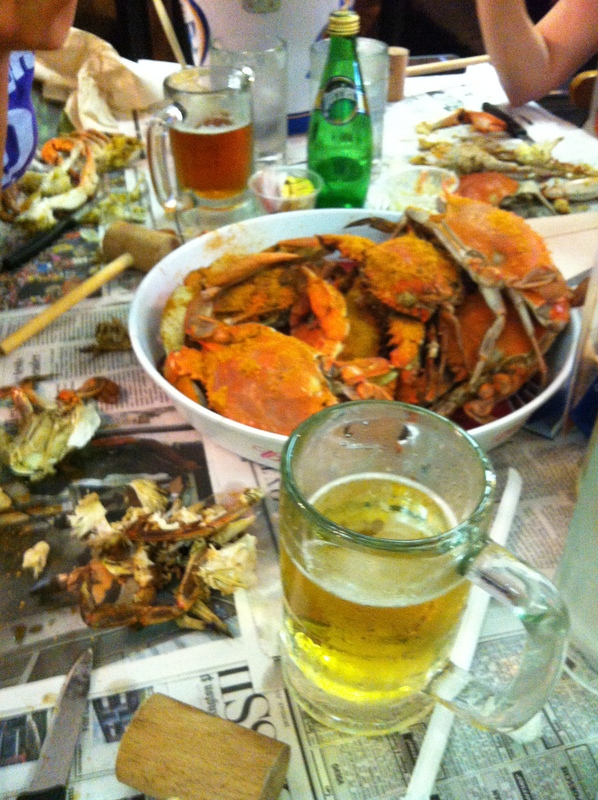 Newspaper on the tables, cold beer, crabby smell — the real deal. 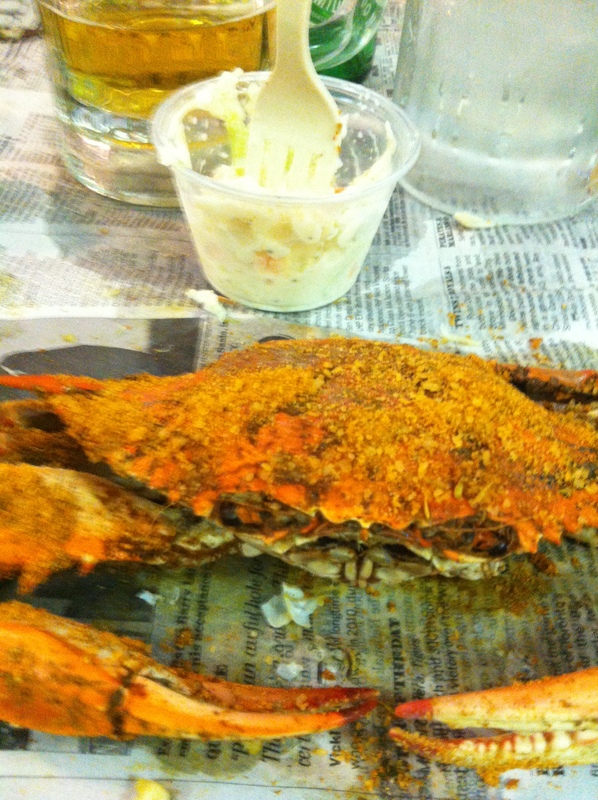 Order the Crab Feast and you get unlimited small and medium crabs, slaw and corn on the cob for $39. There is nothing else to say but grab your mallet and start picking . . .
From time to time, something will spark an interest in me to read up on someone or something and learn as much as I can. Several years ago, watching The Tudors television show sparked a small obsession with Henry VIII and I found myself reading up on his dynasty for months (The Autobiography of Henry VIII by Margaret George is one of the best novels I have ever read as a result). More recently, watching the film Julie & Julia again for the I don’t know how many-th time, I decided I should probably read the book on which half the movie was based — My Life in France. As interesting as it was to hear Julia’s story in her own words, what struck me most in reading this book was how one consciously starts to plan for the end of life as they age — in Julia’s case, placing her ailing husband in a home to be cared for, closing up their house in France for the last time, deciding to write her story . . . This innocent little book certainly made me think in ways that surprised me. And this book lead me to another — As Always, Julia: The Letters of Julia Child and Avis DeVoto. An amazing collection of over 200 letters between Julia and her friend/self appointed book agent chronicling their friendship, the reality behind Julia’s major oeuvre, Mastering the Art of French Cooking, as well as life’s daily trials and tribulations for two strong minded housewives in the mid-twentieth century. Letters were their way of getting to know one another as they didn’t actually meet for several years after the correspondence began, so it is a very revealing glimpse into a truly special relationship. And that was all it took for me to be smitten with Julia. One movie, two books and to cap it off (just like in the movie) . . . a trip to the American History Museum this past weekend to see Julia’s real life kitchen in person. Small and chock ‘o block full of well-loved kitchen gear it’s a snapshot of American life, a great American life . . .